Location: Anamur, Mersin Province, Turkey. Notes: Mamure Castle (Turkish: Mamure kalesi) is a medieval castle in the Anamur District of Mersin Province, Turkey.The castle was built by the rulers of the Armenian Kingdom of Cilicia on the foundations of a fourth-century Roman castle. Designed to protect against pirates, it was repaired during the Byzantine era and during the Crusades. 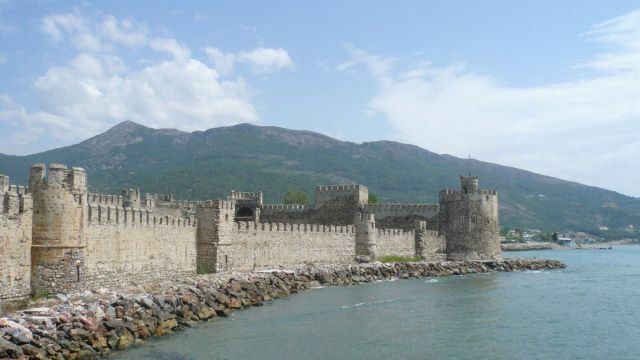 When Alaattin Keykubat I of Seljuk Turks captured the ruins of the castle in 1221, he built a larger castle using elements of the earlier fortifications. Later, it was controlled by the Karamanid dynasty (who ruled a Turkish state in Anatolia). Although the exact date is uncertain, according to an inscription by Ibrahim II of Karaman in 1450, the castle was captured during Mahmut's reign (1300�1311). The castle was renamed as Mamure (prosperous) after repairs by Mahmut. In 1469, the castle was annexed by the Ottoman Empire. It was subsequently repaired in the 15th, 16th and 18th centuries and a part of the castle was used as a caravansarai.